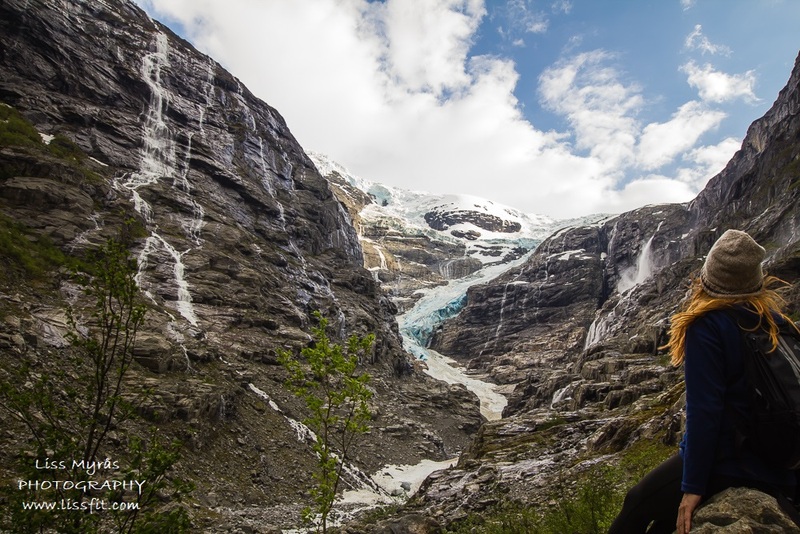 One of my favourite alternative suggestions for visitors when I worked at the Jostedalsbreen Visitor Center was to visit Kjenndalsbreen glacier instead of Briksdalsbreen glacier. Briksdalsbreen is the most well-known and easy accessible glacier in the area, but Kjenndalsbreen is far more beautiful and much less crowded than Briksdalsbreen… and the narrow pictorial road along lake Lovatnet – leading you into the Kjenndalen glacier – will give you a godsmacking experience for sure! And I would not claim this if I hadn’t visited them both, Briksdalsbreen many years ago when I was attending tourism and travel-school has retreated a lot, and Kjenndalsbreen last spring/summer have retreated again too, but are still looking good – it was an absolutely breathtaking moment when the weather gods finally let the sun break through that magic evening – simply a “bellissimo viaggio”. 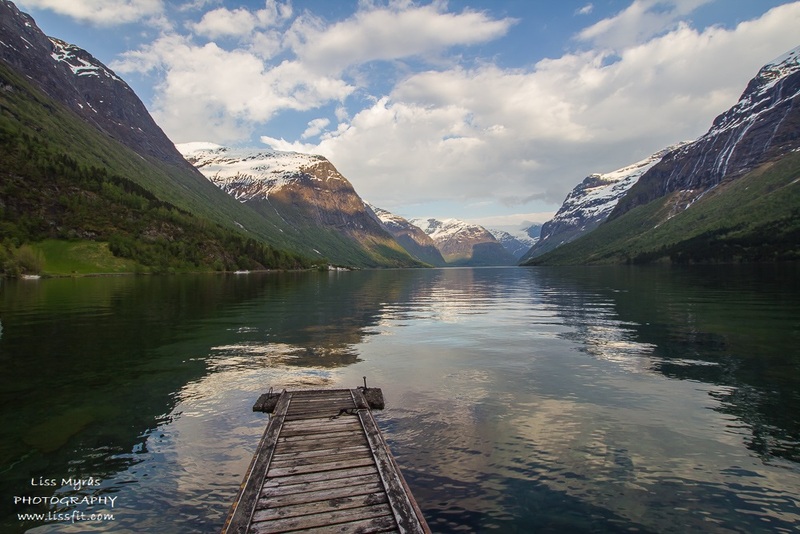 This was the first of 3 bicycle trips I did to Loen area when I was working in Oppstryn for a month. The weather was a bit dull & grey when I decided to pack my stuff and bicycle 35 km into the beginning of Lovatnet and stay over night. 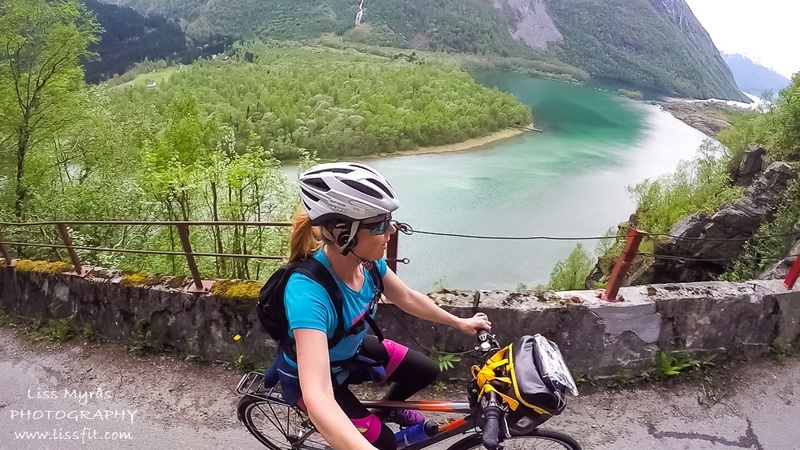 Steep and narrow roads with great views – it is not boring I can promise you. And wow what a job to build these roads in the old days! I intended to sleep in my tent, but when I had a “dinner-break” at Loenvatn Feriesenter I ended up getting a discount on a cabin since it was early season and I was solo. The friendly chef had a lot of knowledge about the glaciers in the area and also about the tragic history regarding the accidents at Ramnefjellet. He also lended me a book about this, so if you want first hand information regarding these subjects, make a stop at this place! Combined with great food (their traditional “kjøttkakemiddag” is delicious – try it! ), smiling faces and awesome views I had a very very nice and informative stay. Back at the lodge that evening I went down to this little pier right below my cabin – and managed to take this nice photo of Lovatnet before the sun disappeared and the wind and rain took over during the night. So, when I had packed up I decided to bike the remaining 17 km into Kjendalsbreen that same evening, as the weather seemed to lighten up even more. 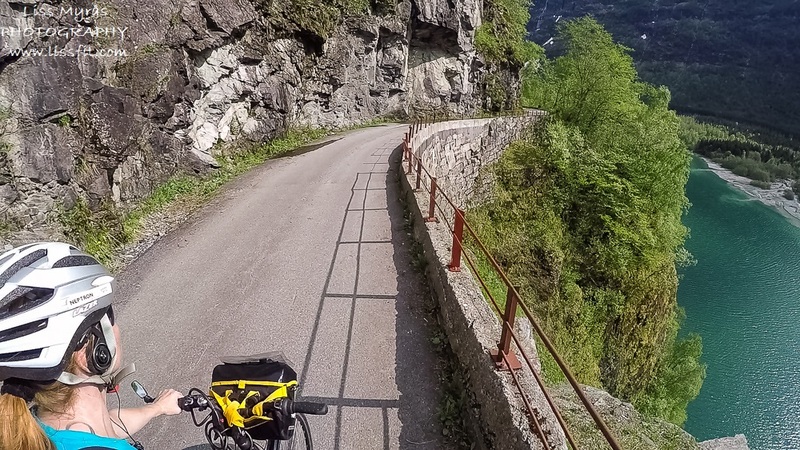 The bike trip into the glacier was a real thrill, and before the last km of gravel road starts you will have to move along some narrow steep road hammered in the mountain side…with a first class view to the rock slide wounds of the famous Ramnefjellet – wow what a magic evening! There is a little parking lot and a outhouse at the end of the gravel road leading to Kjenndalsbreen glacier. You can fill your water bottle in the glacial river with clear conscience, just don’t fall into it. You have to walk 10-15 minutes on a trail if you want to get closer. There will be warning signs to stop you from going to close, mostly because of the falling rocks you will hear now and then from the mountain sides. It is a steep valley alright. At first I was totally alone there, but as the evening sun gradually broke through, 4 or 5 other persons popped up here and there to view this magnificent sight. The glacier has retired quite a bit alright, but is still an impressive sight up there with its white and blue ice. 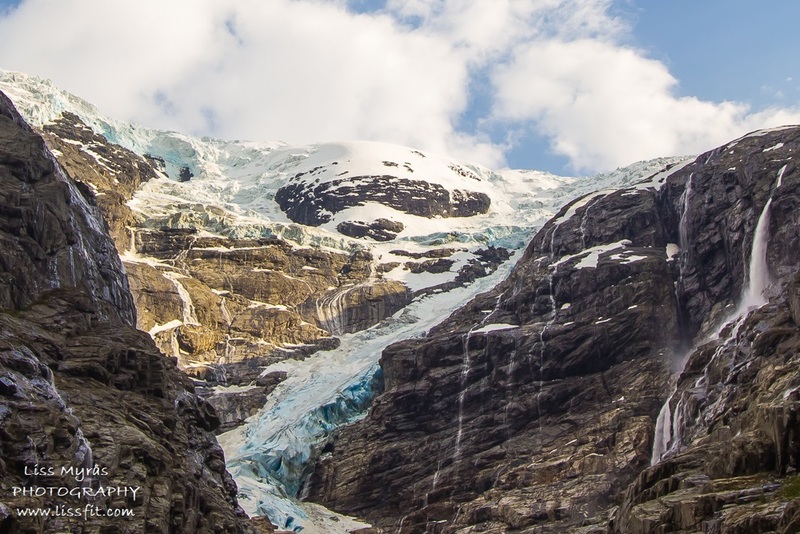 This valley will surround you with its many never-ending waterfalls, some greenery and the river flowing from the glacier in the middle – it is just one of the steepest and most beautiful valleys i have ever been to – ice-cold paradise! 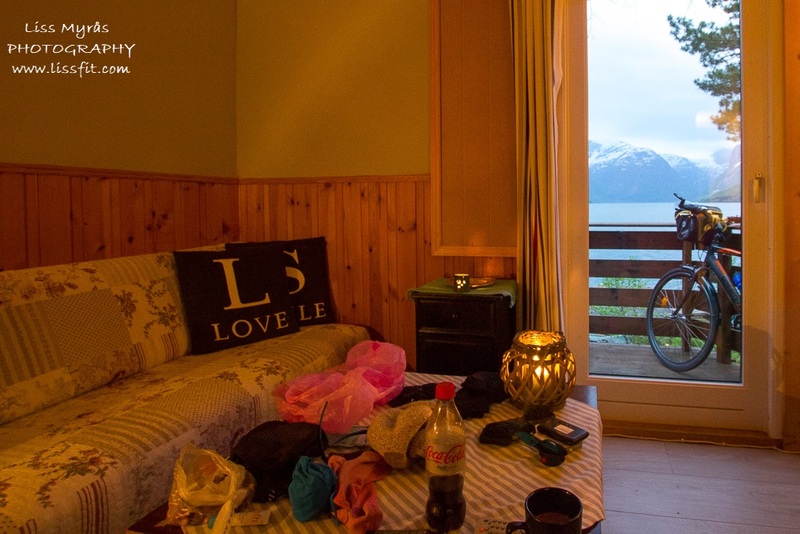 Back in the cabin for a meal and an evening sofa relax – with a view towards Lovatnet and Kjenndalsbreen at the far end of the lake. Well, good night then! Before the last km gravel road you can take a break at Kjenndalstova café.